AIR FLOW METER - ANEMOMETER. TWO APPLICATIONS: (1) HEATING and COOLING REGISTERS in Floor and Wall; (2) FLUE EXHAUST GAS SPEED Either Positive or Negative Pressure ADJUST AIR FLOW and FLUE EXHAUST SPEED, cfm Meter will measure So you Can Adjust your DAMPER. APPLICATION (1) Measure the ROOM-AIR Speed coming out of your Floor and Wall Register. Adjust the branch-duct damper feeding this room to adjust the correct speed coming out of the register. You can also adjust the vane controls in the register, but that is not the way to make your duct system balance. APPLICATION (2) Measure the FLUE EXHAUST SPEED either inside the combustion chamber or at the flue exhaust hood end. FIXED SPEED Flue Exhaust Fans can not be adjusted for speed so they must have DAMPERS inserted into the system to cut back air and flue exhaust. This AIR FLOW METER or ANEMOMETER will enable you to control your air flow by measuring it inside the combustion chamber. You place the Meter and the Vane Fan Blade inside the combustion chamber with the VANE TURBINE BLADE at the rear where the air comes into the combustion chamber. After you set the meter inside the combustion chamber, shut the door, turn the stove on with with flue exhaust fan coming on immediately and you read the meter through the glass door window. The Fresh Air DAMPER is then adjusted accordingly to set the speed of air flow or flue exhaust flow through the combustion chamber. This meter with also measure air temperature. It has a large, easy-to-read backlit LCD including primary and secondary displays plus numerous status indicators. 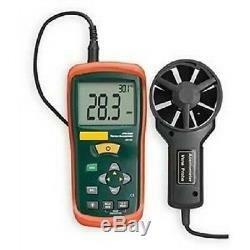 This Anemometer is recommended for use by most corn stove and wood pellet stove manufacturers. Installers of Rear-Mounted Flue Exhaust Kits frequently use this Anemometer. REAR-MOUNTED FLUE EXHAUST FANS installed by corn and wood pellet stove manufacturers have in the operating instructions that the air (flue) should be measured by an Anemometer. Fan motors that do not have a "split capacitor" can not have the speed varied by a rheostat, and you have to use a damper to vary the speed. 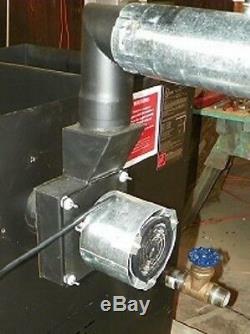 The stove FRESH AIR DAMPER can be adjusted (opened or closed) to regulate the flow of air or flue exhaust gas. 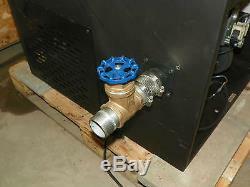 See the enclosed PICTURES of the Anememoter, Rear Flue Exhaust Fan, and the Gate Valve FRESH AIR DAMPER. The parties waive any other venue to which either party might be entitled by domicile or otherwise. Weight 5 lbs, 9V Battery. 5 Amps, 3.9 ft of vane sensor cable, Vane Sensor Turbine, Meter LCD, measure Air Temperature and Air flow CFM and/or fpm, carrying case included. Ealer, 1312 1st Avenue, N. One three one nine two nine eight zero five zero zero. The item "AIR FLOW METER, ANEMOMETER, Measures AIR FLOW CFM" is in sale since Friday, May 13, 2011. This item is in the category "Home & Garden\Home Improvement\Heating, Cooling & Air\Air Conditioners & Heaters\Furnaces & Central Heating Systems". The seller is "cornstoveiowa" and is located in Cedar Rapids, Iowa. This item can be shipped worldwide.